Well lookie here. The leaks have just been slipping enough lately that I may just say, “It’s raining Windows Phone 7, Hallelujah”! Ok, maybe not, but there have been quite the few leaks to look into these past couple of weeks. First it was the unannounced Samsung phone that looked almost like an exact replica of the highly acclaimed i8910 Omnia HD, which later was revealed that it is the Samsung Cetus i917 due out for AT&T. Then it was the LG C900 who popped up next, which is also AT&T branded and due out in the near future. 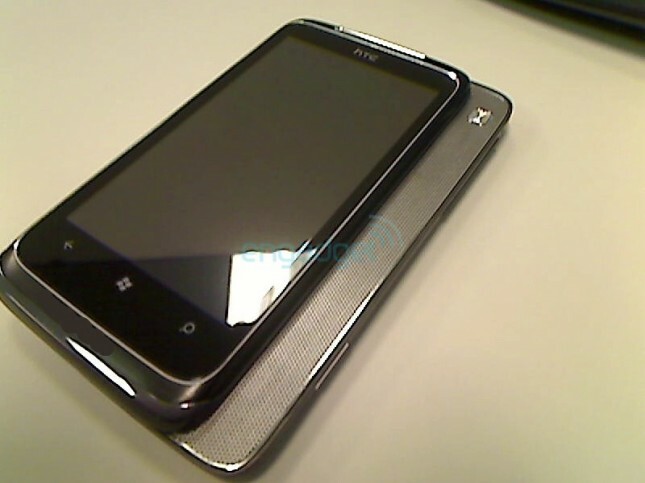 Today we have the latest Windows 7 phone leak, the T8788, an HTC built device which looks very polished like it is ready to start production. Of course the T8788 model name will change before it is ousted to the masses, but the unique feature about this particular device is the landscape slide-out speaker. When you first take a glance at it you obviously notice the device will slide out in landscape mode, but when you slide the screen up, there is no keyboard under the screen. It is a full fledged speaker underneath, which sort of reminds you of that other phone that also slid out a speaker back in the days. Being that there is a speaker instead of a full QWERTY keyboard underneath, nice 3.7 in. screen (as it seems from the photo), it sounds like this device will be heavily advertised to be media-driven. Word has it there is also a kickstand on the back for easy viewing for movies and video clips. So who’s going to connect their Bose desktop speakers to this once it comes out?